Good news, everyone! NT Language Inc. offers free training for English Proficiency 101. Applications for the month of May 2019 scholarships are now available. 1. Photocopy only! Two (2) copies each except for the updated resume. NT Language Inc. is located at 6th floor NT Center Building Alabang-Zapote Road, Tierra Nueva Village, Brgy. Cupang Muntinlupa City. ("Tabi ng Subaru Cars at tapat ng Caltex, the building is color blue") . Follow their facebook page for more updates. 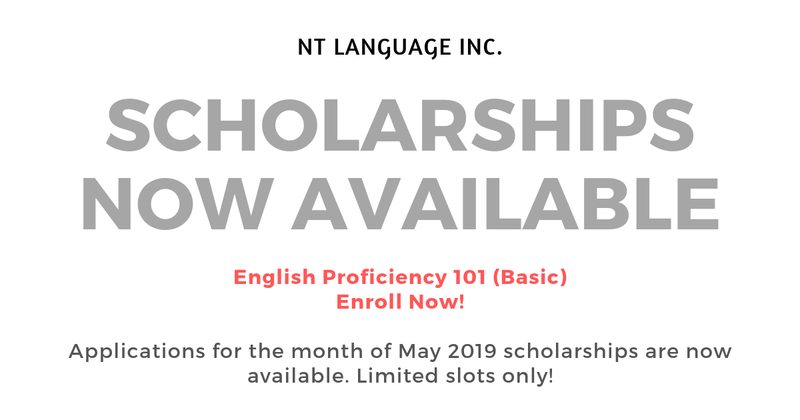 NT Language Inc.
TESDA Accredited!, Limited slots only! Visit us and reserve yours now!